A bank robbery is being carried out by a super-powered couple named Cutthroat and GlowBug who have slaughtered staff and customers alike. A green-skinned, fin-headed police officer named Dragon leaps into action against the pair and quickly strikes GlowBug unconscious. He proceeds to battle Cutthroat one-on-one until Dragon convinces his opponent to surrender through sheer intimidation. As he brings out his prisoners, a crowd of civilians cheer Dragon. A fellow officer welcomes Dragon to the police force and asks if was a tough day but the hero replies that he has had worse. The man who would become Dragon is discovered in a burning field and is taken to a nearby hospital to recover. He is visited by Lieutenant Frank Darling of the Chicago Police Department who questions the patient. It soon becomes evident that the young man has no memory of his life as he cannot answer any personal questions. Frank is alarmed to discover that the freak can recall seemingly irrelevant trivia but has complete amnesia concerning his own existence prior to being found in the field. Frank returns home to his wife Mildred where he talks about this bizarre case. As they finish their evening meal, a news report is delivered by reporter Sam Haze regarding local hero SuperPatriot. The hero that has fought crime since the 1940s has been brought to hospital with his limbs crushed beyond repair and half of his face missing. Dragon is visited in his apartment by Frank who explains how the Chicago Police Department is rapidly losing their battle against super-powered mutants. He pleads with Dragon to join but the pressure of being considered a potential saviour to the city is too much for Dragon and he declines the offer. Frank returns home and vents his frustration to Mildred. He speaks of how he got Dragon a job with his cousin Fred at his shipyard which in turn gave Dragon a place to live in the form of the loft above the warehouse. Frank feels that Dragon owes him and has wasted his time, something that Mildred disputes by pointing out that had Frank not provided a positive influence to Dragon, his colleagues on the police force may have ended up facing him too. At the aforementioned shipyard, two super-freaks are in the process of stealing from Fred Darling when they are opposed by Dragon. Hardware has his hand and gun crushed before getting his head rammed into a wall. SkullFace leaps into action but is backhanded away with ease before questioning why Dragon is not working with them. He is powerful enough to take whatever he desires and SkullFace cannot understand why he would simply work for a living. The police arrive to take the villains into custody and as they are taken away, Hardware threatens the life of Dragon. Fred begins to pack up his belongings in preparation of fleeing his home as he believes that Dragon has doomed him over money. Dragon vows to protect Fred from harm but an explosion tears through the warehouse and kills Fred. As the building burns down, Dragon emerges from the wreckage. A report on WHAM TV reveals how another hero from the 1940s has fallen as Mighty Man has been murdered. The hero’s human form of Robert Berman was brutally beaten and then stabbed in his Elgin, Illinois home. The 67 year old was discovered in his home and brought to hospital where he briefly regained consciousness but ultimately passed away from his injuries. Frank had just watched this report when a knock at his door reveals a naked Dragon who explains how bad guys killed Fred and blew up his warehouse. Dragon is now prepared to join the police force and wishes to be put through the police academy as soon as possible. A number of police cars surround a house and the officers present are pinned down by gunfire. A young officer named Alex Wilde calls in back-up as Dragon arrives on the scene and gets briefed on the situation. Twenty three men have taken a model named Amanda Mills hostage and have killed a number of people already. Dragon loads up with weaponry before leaping high into the sky and crashing down through the roof. He quickly guns down all but one of the criminals without killing a single one of them. The final gunman threatens to shoot Amanda but is impaled by four throwing stars, fired off by a vigilante named Star. This costumed hero departs before he can himself be arrested for operating outside of the law. 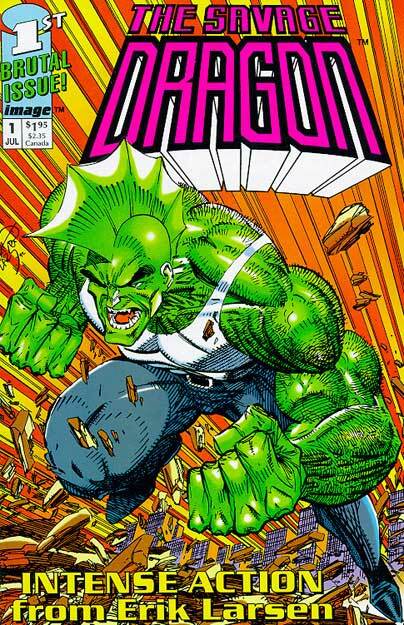 One of four different pinups (all by Erik Larsen), depending on the color logo on the cover. – Pink and Green Savage Dragon logo: ? ?